A single striped fabric magically transformed into chevron blocks lights up the front of this easy pieced, semi-fitted jacket with figure-flattering shape and curved hemline. 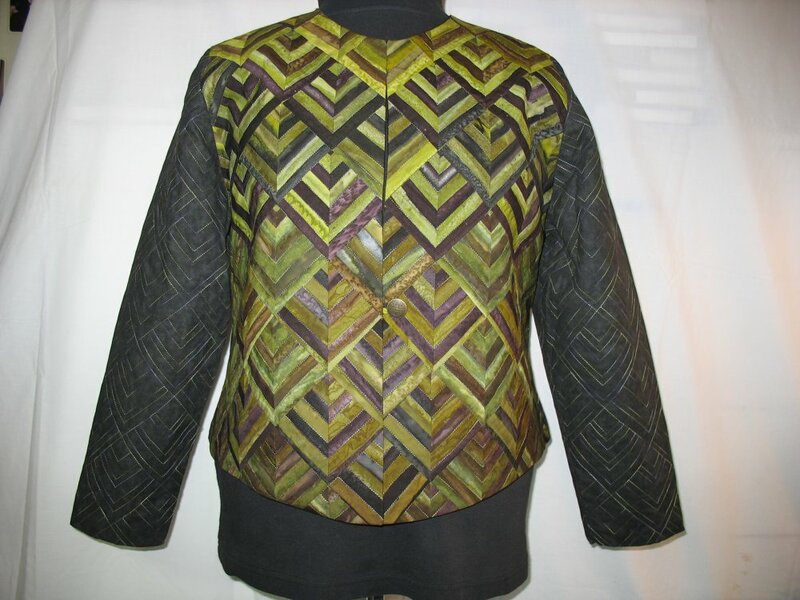 The chevron design is repeated in the simple quilting on the plain sleeves and jacket back (template included). All sizes, XS-XXL, 4-26. KIT available in numerous color combinations, including orchid/purple/magenta, olive/brown/eggplant, slate blue/red/green, brown/orange/fall colors, blues, dull willow greens, red/green/beige/gold/xmas colors. KIT INCLUDES pattern, striped fabric and solid fabric for back and sleeves. Kit does not include lining and notions needed to finish project. THREAD for quilting available for the orchid/magenta, olive/brown and slate blue/red jackets. BE SURE TO SELECT COLOR WHEN ORDERING KIT OR THREAD.